The odds were always stacked against Mooseheart’s girls basketball team in Tuesday’s Class 1A Aurora Christian Regional semifinal against top-seeded Newark. 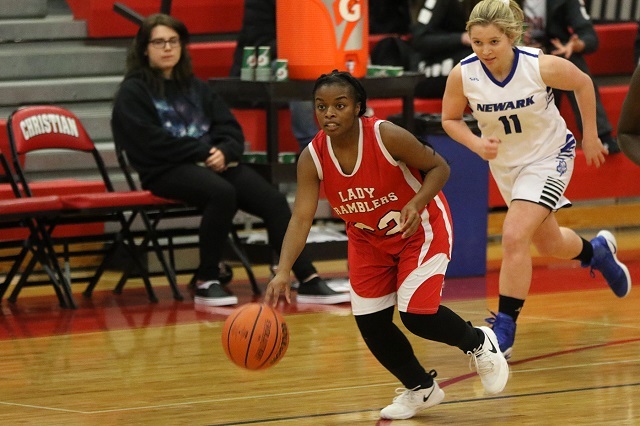 After some initial success, the Lady Ramblers had to deal with an opponent that got better as the game progressed, and their season ended following a 66-20 loss. “We drew a tough seed in this regional. I told the girls that if we get some quality wins in the course of the season, maybe we don’t have to face the No. 1 seed every year,” Mooseheart girls basketball coach Bryan Miller said. The Ramblers stayed within striking distance of Newark through the first quarter, only trailing 12-6. Newark steadily pulled away the rest of the game. “Obviously, Newark wasn’t at the top of their game at the start, but I was happy with our effort,” Miller said. Mooseheart was led in scoring by Omoyi Omana, who scored 8 points. Omana was one of two Mooseheart seniors who played her last game on Tuesday. The other was point guard Jordan Plummer, who scored 2 points. Miller added that for the returning players, the next season has already become as they look to improve their skills before practice begins in November.